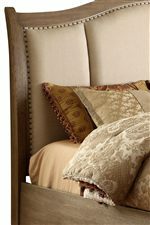 Decorate your master bedroom with this beautifully crafted armoire. 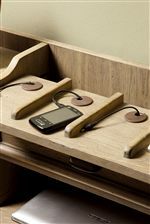 Constructed from hardwood solid and Ash & Oak veneer, this piece has a rustic Weathered Driftwood finish that is comfortable and homey. 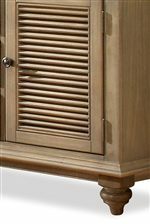 Two wrap-around doors with beveled edge mirror inserts enclose two shelves, one which is adjustable, as well as three drawers with felt-lining. 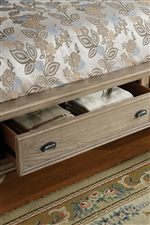 Below are two more drawers, the bottom of which has a Cedar veneer bottom, perfect for tucking away bulkier items such as jeans and sweaters. 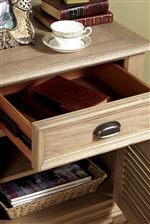 Drawers are decorated with tip restraining hardware knobs in a chrome finish. Complete your bedroom with the Coventry Armoire. Available in Weathered Driftwood and a two tone Weathered Driftwood and Dover White finish. The Coventry 2 Door Mirror Armoire with 5 Drawers by Riverside Furniture at AHFA in the area. Product availability may vary. Contact us for the most current availability on this product. Storage Two wrap-around doors enclose an adjustable shelf, fixed shelf, three drawers, and wiring access hole. Below are two more drawers.